This series has become wildly popular with many graduating classes already under our belt. It continues to sell out quickly, so register early. 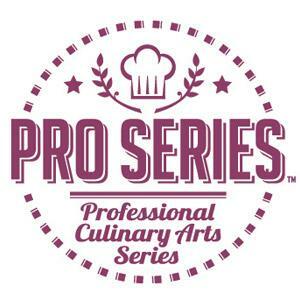 Whether your desire is to build upon your existing skills or jump start your passion for cooking, we promise this professional chef series will change the way you approach your kitchen! Designed after a typical first year of chef training, and taught by seasoned culinary professionals, this 9-week course will take your cooking skills to a new level. If you’re serious about learning to cook… and you think you might look pretty darn good in a white chefs' jacket, then join us. Think you’re ready to take your cooking skills to the “next level”? Do you think you’d look pretty good in a chef coat? Then find out more about our Professional Culinary Arts Classes & Series™ for the serious cook where you can build upon your existing skills, or jumpstart your passion for cooking. For more information about our Professional Culinary Arts Series™ and Professional Culinary Arts Classes™ cooking classes, visit our kcculinary.com website. In this first important class, you’ll learn how to identify and purchase knives, maintenance, the anatomy of a knife, shapes, how to hold and feel for balance and proper weight, storage principles, how to hone and sharpen, how to hold a knife properly, rocking and chopping, and the chef’s “claw.” You won’t just be introduced to your knives. You’ll receive serious hands-on experience as well as learn the basic cuts using a knife. A class that you can truly build upon. Excellent chefs know that there are appropriate cooking methods for each cut of meat. The knowledge learned today will be applied to recipes you choose to cook for the rest of your life. Meat identification; preparation techniques; trimming; applications to cooking methods such as roasting, braising, marinating (with and without a vacuum seal); sautéing; grilling; quick cooking and pan searing. We will cover the different styles of seafood and the cooking methods that pair with them. You’ll learn seafood identification, prepping and trimming for the various cooking methods, freshness testing, proper storage and much more. You’ll learn easy methods for ensuring freshness and for opening oysters and clams. We’ll learn as we create some fabulous seafood dishes. Fundamentals of vegetable cookery including identification, prepping (an essential part of every vegetable dish) and cooking techniques. We’ll learn which vegetables are best for the various cooking methods such as sautéing, roasting, glazing, stewing and steaming. All vegetable cooking methods will be covered including blanching and shocking to preserve freshness and color. We’ll work together as we make tasting samples of some perfect vegetable preparations! This class will cover all aspects of moist heat cooking including such techniques as steaming, “en papillote” (in paper), poaching and braising. Once mastered, these methods are extremely easy to apply to various foods. You’ll learn which “proteins” are best for each of the methods, proper prepping, cooking and serving techniques. We’ll also learn “shallow poaching” and some simple sauce-making skills. This course will teach dry heat cooking techniques such as searing, roasting, broiling and grilling. We’ll learn about protein fibers and what happens to them during the various cooking methods. We’ll take a look at which proteins are best for the various cooking methods and we’ll explore some combination methods (such as searing then roasting) and why this works so well. Prepping, cooking, serving, carving, etc. Tonight it’s all about the art of sauce-making as we deconstruct the basic Mother Sauces of Tomato, Velouté, Bechamel, Espagnole and Hollandaise. Along with this knowledge comes preparation of thickening agents and stocks as well as how to use these preparations in dishes. You’ll learn in an intensive hands-on setting. You know the Mother Sauces now so tonight we’ll build upon that knowledge by teaching how to make some interesting and easy “small sauces.” We will learn to deglaze a pan using the drippings and/or wine to infuse flavors. Learn to make and use a beurre manie to finish and thicken your sauce or gravy. All these methods will be taught in a power-packed “hands-on” class. It’s the grand finale to our Professional Culinary Arts Program. Tonight we’ll practice what we’ve learned throughout the 8 weeks we’ve cooked together. The class will be divided into groups with each team challenged to create a dish that uses what you’ve learned. Not to worry, the instructor will be walking the room to give advice and assist. When you’ve placed your dish on the Grand Buffet you’ll have an opportunity to explain your cooking processes and get feedback from your colleagues and from the teacher himself.